I'm not sure anyone under 70 really understands just how much America used to love smoking. The fact that cigarette lighters became standard in cars is a pretty big clue, but I think even more telling is the fact that it seems people would work smoking into anything they could. Like testing airplane cockpit integrity. This little clip is from a May 1954 Issue of Popular Science, part of a huge treasure trove of old magazines sent to me by Evan, a very generous Jalopnik reader. 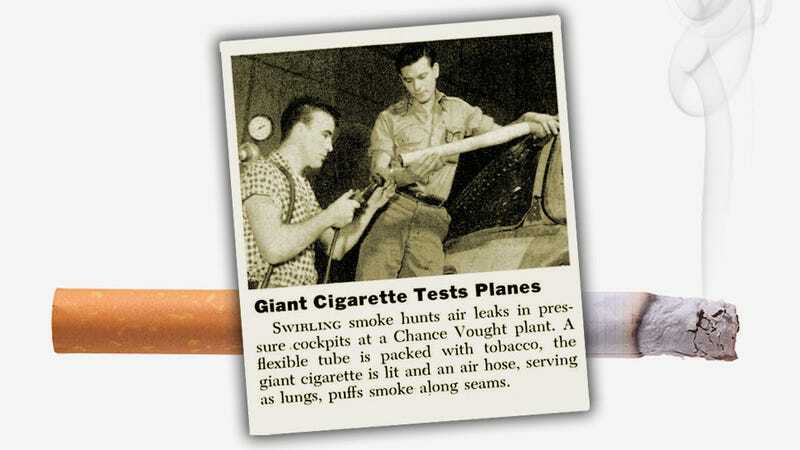 It's fascinating because there had to be other ways to test cabin integrity other than making a giant tobacco cigarette. It feels like they're trolling the future. Is it possible Chance Vought factory didn't have any other way of introducing some sort of inert smoke or visible vapor into a cockpit via some sort of pressurized rubber hose doohickey that all factories seem to have laying around everywhere? At some point, the issue of how to confirm that airplane canopies were airtight arose, and a bunch of very smart people sat around a table with slide rules and sleeves rolled up and ties pulled ever-so-slightly askew, and the best plan they came up with was "let's get a shitload of tobacco and a rolling paper the size of a pillowcase and let's make a huge motherfucking cigarette?" I haven't been able to find many other references to this method online just yet, but I'll keep looking. I'm sure they also had a colossal glass of scotch to use for liquid-immersion tests. It's amazing. These guys really, really, really loved smoking.